Local government in Dorset is changing. Next year, Dorset County Council and all other councils will be replaced by two new local authorities. In the east of the county, a Bournemouth, Christchurch and Poole Council will be established. The Commission’s electoral review has drawn up wards that will be represented by the new council’s 76 councillors. The arrangements will come into effect at the council’s first elections next year. 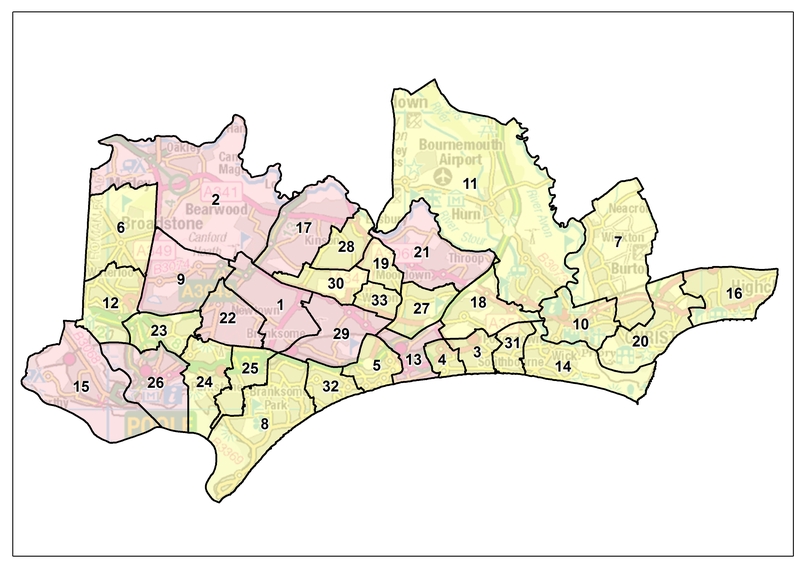 A review of ward boundaries for the new Dorset Council, covering the rest of the county, has taken place at the same time. The Commission’s final recommendations propose that Bournemouth, Christchurch and Poole’s 76 councillors should represent ten three-councillor wards and twenty-three two-councillor wards. Professor Colin Mellors, Chair of the Commission, said, “We are grateful to people across Bournemouth, Christchurch and Poole who took part in the review. The Commission has looked at all the evidence that was put forward during the consultation. In Poole, the Commission has changed its proposals for Creekmoor and Broadstone wards so that Pine Springs Drive, Twin Oaks Close and Edwina Drive areas will be part of a Broadstone ward rather than Creekmoor as previously proposed. In coming to its view, the Commission listened to the views of around 300 people who contacted the Commission during the consultation to describe community links in this part of Poole. Elsewhere in Poole, local people and organisations argued that community identities would be better reflected by including the areas of Constitution Hill Road, Danecourt Road and Harbour View Road in Parkstone ward. In its draft recommendations, the Commission had included the area in Oakdale ward. The Commission has accepted the arguments made by local communities and has changed its proposals. Residents also commented that the use and management of Upton Country Park would be better reflected by its inclusion in Creekmoor ward rather than Oakdale ward as previously suggested. The Commission accepted the evidence presented to it and includes that change as part of the final proposals. In the north of the new council’s area, the Commission’s draft recommendations proposed to combine Bearwood with parts of Kinson to form a Bearwood & Kinson South ward. People who responded to the consultation argued that the A348 Ringwood Road was a strong barrier between Bearwood and Kinson. Others argued that Bearwood shared better linkages with Merley. In response to these views, the Commission has changed its proposals to create a Bearwood & Merley ward alongside a Kinson ward which unites the Kinson community. In central Bournemouth, local people and groups argued that the Commission’s proposed boundary between Bournemouth Central ward and Westbourne & High Cliff ward did not accurately reflect community interactions. They described how Exeter Crescent and Exeter Park Road shared closer links with Bournemouth Central ward than the draft proposal to include them in Westbourne & High Cliff ward. The Commission considered those views carefully and has changed the recommendations as a result. When it launched its consultation on draft proposals, the Commission asked local people and groups for their views on the best pattern of wards for Christchurch town. In response, the Commission heard evidence that the community surrounding the railway station should be in a single ward. The Commission therefore proposes that the area between Jumpers Road and the railway line should be part of a Christchurch Town ward. Elsewhere in Bournemouth, Christchurch and Poole, the Commission has made minor amendments to the wards it originally proposed as well as changing the names of several wards after listening to local feedback. The changes, and the full recommendations, are available on the Commission’s website at www.lgbce.org.uk. In May 2018, the government confirmed changes to local government in Dorset. The decision means the creation of a new Bournemouth, Christchurch and Poole Council for the eastern part of the county. Full details of the Commission’s final recommendations (including maps) can be viewed at: https://consultation.lgbce.org.uk/node/13247.